The One True Chowder | Food It Yourself! Want to start an argument? Ask three or four friends of Italian heritage how to make the best tomato sauce. Or ask your Vietnamese buddies what really goes into pho. Go on-line and ask how authentic Hungarian goulash is seasoned. Few things get people’s hackles up more than a perceived challenge to the way they prepare a culturally important food. I’ve definitely gotten myself mixed up in the long-standing almond vs. anise biscotti conflict. Here’s the thing, though. The right way to make anything is the way you and your household likes it. Not a fan of oregano? Then leave it out of the tomato sauce. Nobody will die, I swear. Do you adore lemon grass? Add lots and lots to the pho- it’s your dinner! Never forget that you are a part of your food culture. The way you cook is automatically authentic because it is yours. Aromatics, assemble! 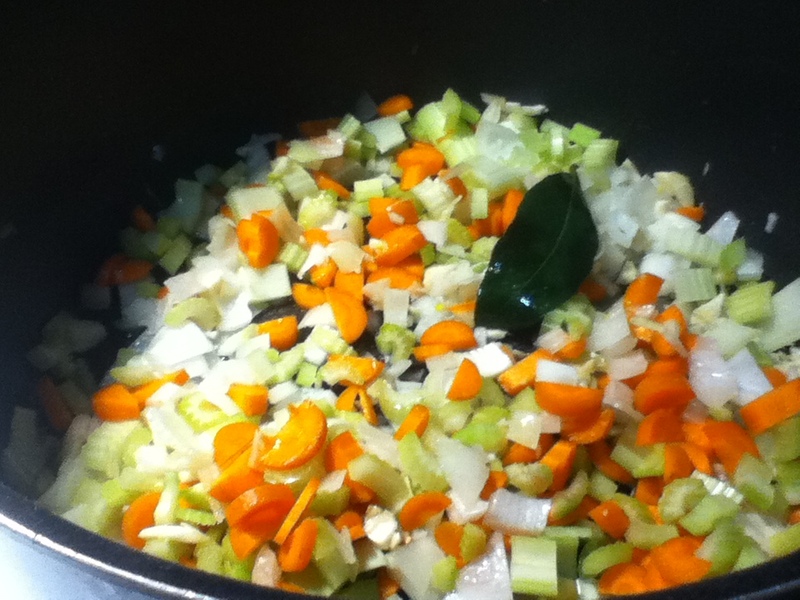 I use all of them- onion, garlic, celery, carrots, and a big old bay leaf. Sweat it all down with just a little sprinkle of salt, it takes about 15 minutes or so. Potato selection is another point of argument in New England chowder production. I prefer red skinned potatoes, with the skins on. I could come up with some rhetorical defense for my skin-on position. The fact is my potato peeler is trying to kill me, so I leave the skins on nearly everything lest my entire income be spent on bandages and antibiotic ointment. Here’s the liquid from six 6.5 oz cans of clams. 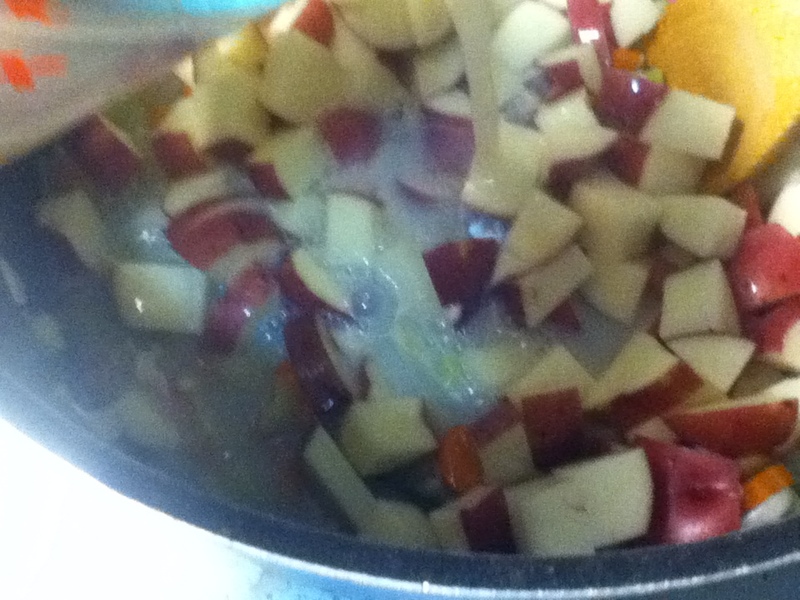 Let the potatoes simmer for 20-ish minutes or until cooked through. The time really depends on how small your potato chunks are. This is also a good time to add a good amount of black pepper, a small handful of parsley (about a scant quarter cup) and two teaspoons of thyme. Being as it is early April I have only the dried forms of these herbs, but use fresh if you have them. Not a great picture, but you want to smash some of the potatoes. 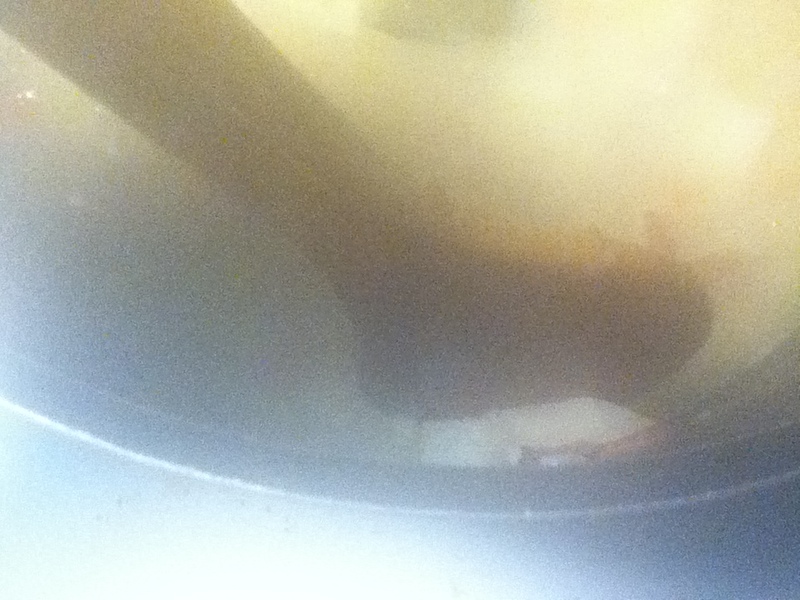 The starch thus released will add just a little thickness to the final chowder. Once the potatoes are done I add more vegetable goodness in the form of frozen corn kernels. Once those have thawed, I add just a small splash, maybe half a cup, of half&half and it is ready to serve. 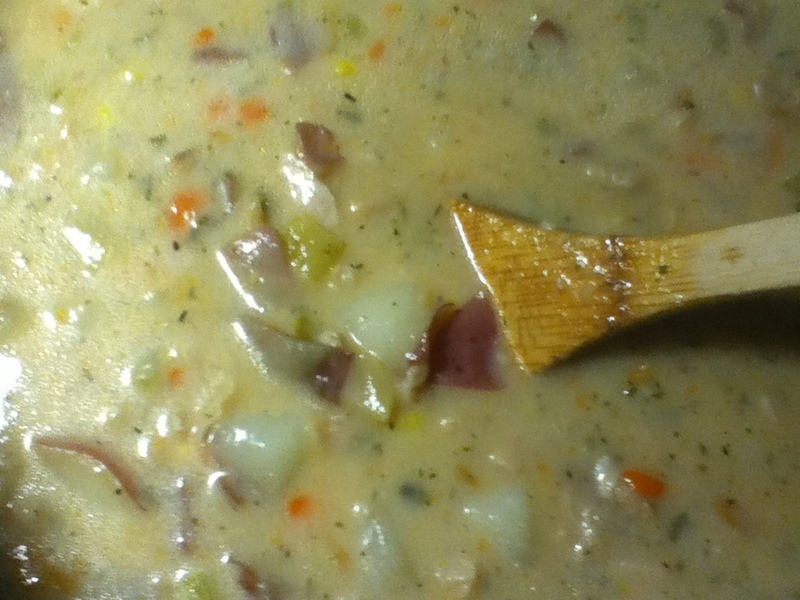 You may not like my clam chowder. That is perfectly okay because it means I do not have to share my leftovers, and it means you are more likely to make your own chowder the way you prefer it. Seriously, you should do it. Give it a try! Put your own signature on your DIYet and embrace your place in the food culture you live with. Let me know what you cook up in the comments! Pingback: Minestrone | Food It Yourself! 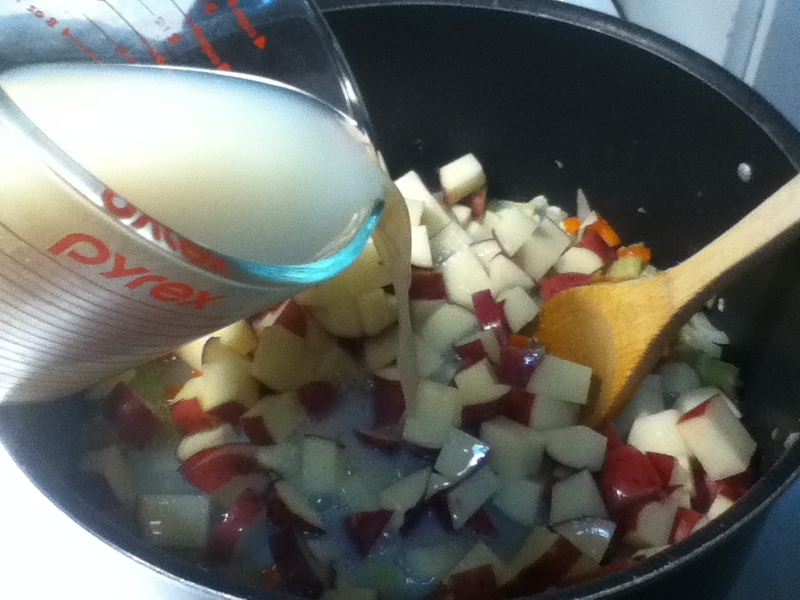 Pingback: I’m Tellin’ Mom You Called Me Soupid | Food It Yourself!